Please type your desired tags, e.g. Mathematical Science, Geospatial Information Science, Public Policy, Cognition and Neuroscience, Psychological Sciences, HiC, Software Engineering, Supply Chain, water power, Asian Studies, Poverty, History of Medicine, Twentieth-Century American Literature, Texas History, Poetry, and etc. 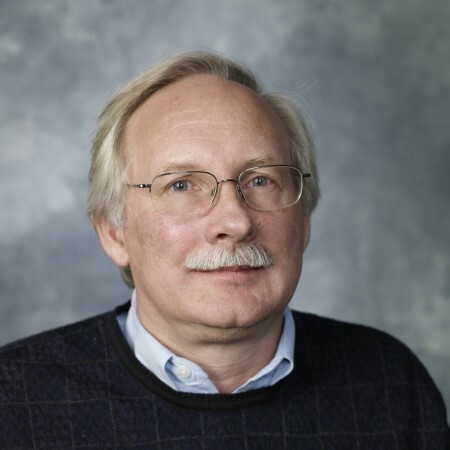 He is a founding member of the SAGE geophysical field camp, a consortium of academic geophysicists and the Institute of Geophysics and Planetary Physics at Los Alamos National Laboratory. Starting in 1983, SAGE has had over 500 students from institutions around the world. In addition, the faculty and students publish research on the Rio Grande Rift on a regular basis. In 1998 SAGE won the American Geophysical Union Excellence in Geophysical Education Award. Lai, S. F., J. F. Ferguson, C. L. V. Aiken and D. Ziegler (1985), A test of gravity and magnetic anomaly inversion in defining the structure of the Sanford Basin, NC as an example of a Triassic basin, 1985 SEG Annual Meeting, Washington, DC. Axilrod, H. D. and J. F. Ferguson (1989), SH-wave modeling in laterally inhomogeneous media: an evaluation of four discrete wavenumber techniques, 1989 SEG Annual Meeting, Dallas, TX. Aiken, C. L. V., M. F. de la Fuente, M. Balde, K. H. Fleischmann, J. Fishman, A. T. Daniels, J. Hare and J. F. Ferguson (1994), The Ecuadorian geodetic/gravity observations (EGO) project: GPS/Gravity acquisition from the Pacific Coast of the Amazon Basin, 1994 SEG Annual Meeting, Los Angeles, CA. Brady, J. L., D. S. Wolcott, P. H. Daggett, J. F. Ferguson, J. L. Hare, C. L. V. Aiken, M. Balde, J. E. Seibert and G. Mader (1995), Water movement surveillance with high resolution surface gravity and GPS: A model study with field test results, SPE Annual Technical Conf. and Exhibition, Dallas, TX. Smith, D. N. and J. F. Ferguson (1997), Constrained inversion of seismic refraction data using the controlled random search, 1997 SEG Annual Meeting, Dallas, TX. Hare, J. L., J. F. Ferguson, C. L. V. Aiken and J. L. Brady (1997), 4-D microgravity modeling and inversion for waterflood surveillance: A model study for the Prudhoe Bay reservoir, Alaska, 1997 SEG Annual Meeting, Dallas, TX. Brady, J. L., J. F. Ferguson, C. L. V. Aiken, J. E. Seibert, T. Chen, and J. L. Hare (2002), Performing a high resolution surface gravity survey to monitor the gas cap water injection project, Prudhoe Bay, Alaska, SPE Western Regional/AAPG Pacific Section Joint Meeting, Anchorage, AK. Brady, J. L., J. Ferguson, J. Seibert, T. Chen, J. Hare, C. Aiken, F. Klopping and J. Brown (2002), Surface gravity monitoring of the gas cap water injection project - Prudhoe Bay, Alaska, SPE 2002 Annual Meeting, San Antonio, TX. Brown, J. M., F. J. Klopping, D. van Westrum, T. M. Niebauer, J. Brady, J. Ferguson, T. Chen and J. Seibert (2002), Preliminary absolute gravity survey results from water injection monitoring program at Prudhoe Bay, SEG 2002 Annual Meeting, Salt Lake City, UT. Hodges, J., J. F. Ferguson and L. Pellerin, (2005), An archaeological investigation of San Marcos Pueblo New Mexico, USA, SAGEEP 2005 Proceedings and Annual Meeting, Atlanta, GA.
Hinz, E., J. Peacock, J. Ferguson and L. Pellerin, (2006), An ongoing investigation of the San Marcos Pueblo, New Mexico, SAGEEP 2006 Proceedings and Annual Meeting, Seattle, WA. Brady, J. L., J. L. Hare, J. F. Ferguson, J. E. Seibert, F. J. Klopping, T. Chen and T. Niebauer, (2006), Results of the world's first 4D microgravity surveillance of a waterflood - Prudhoe Bay, Alaska, SPE 2006 Annual Meeting, San Antonio, TX. Hare, J., J. F. Ferguson, J. Brady, J. Seibert and F. Klopping, (2008), 4D Microgravity surveillence of the gas cap waterflood, Prudhoe Bay, Alaska, SEG Workshop on Unconventional Time-Lapse Geophysics, SEG 2008 Annual Meeting, Las Vegas, NV (invited). Aiken, C. L. V., M. Balde, J. F. Ferguson, G. D. Lyman, X. Xu, and A. H. Cogbill (1998), Recent developments in digital gravity data acquisition on land, The Leading Edge, v. 17, p. 93-97. Ferguson, J. F., W. S. Baldridge, G. R. Jiracek, V. Gonzalez and P. A. Pope (1998). Students investigate environmental restoration site in New Mexico, EOS Trans. Am. Geophys. U., v. 79, p. 329-335. (Also Earth in Space, v. 11, p. 6-9). Jiracek, G. R., W. S. Baldridge, S. Biehler, L. W. Braile, J. F. Ferguson, B. E. Gilpin, D. L. Alumbaugh, (2000), SAGE: Learning geophysics by immersion, The Leading Edge, v 19, p. 986-990. Chen, T., J. F. Ferguson, C. L. V. Aiken and J. Brady, (2005), Real-time data acquisition and quality control for gravity surveys, The Leading Edge, v 24, p 702-704. Jiracek, G. R., W. S. Baldridge, A. Sussman, S. Biehler, L. W. Braile, J. F. Ferguson, B. E. Gilpin, D. K. McPhee and L. Pellerin, (2008), SAGE celebrates 25 years of learning geophysics by doing geophysics, The Leading Edge, v 27, p 1340-1344. 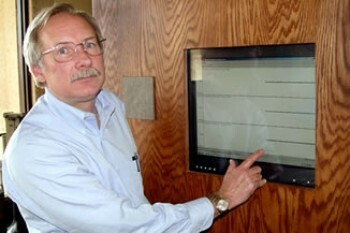 RICHARDSON, Texas (Aug. 4, 2005) – Dr. John F. Ferguson, a noted geophysicist and long-time faculty member at The University of Texas at Dallas (UTD), was appointed head of the university’s Geosciences Department, effective Monday. Ferguson succeeds Dr. Robert J. Stern, department head for the past eight years, who will begin a year-long leave – known as a “special faculty development assignment” – this fall, after which he will return to UTD to teach and conduct research. Stern will teach classes and pursue research projects during the coming fall semester at Stanford University, then move to the California Institute of Technology for the spring semester. Campus events this week will help members of the UT Dallas community not only make sense of the tragedy in Haiti but also play a part in relief efforts. “The Haiti Earthquake: From Natural Phenomena to National Disaster” is the topic of a lecture planned for Thursday, Jan. 21, by Dr. John Ferguson of the Department of Geosciences. The event is scheduled for noon in the TI Auditorium (ECSS 2.102). RICHARDSON, Texas (Jan. 14, 2004) - The next time you feel the earth move under your feet, geoscientists at The University of Texas at Dallas (UTD) will be able to tell you when and how much - on a newly-installed seismograph in Founders Hall. The sensitive scientific instrument, one of only a very few of its kind in the Dallas-Fort Worth area, records seismic waves generated by earthquakes - whether it occurs in an adjoining state or as distant as the other side of the globe. But mostly what it displays — on a computer screen in real-time digital readouts that resemble an electrocardiogram printout - is the "ordinary background noise of the planet," according to one of the instrument's builders, Dr. John F. Ferguson, associate professor in UTD's Department of Geosciences. Review of proposals for the Department of Energy, the National Science Foundation and other agencies. Review of manuscripts for the Journal of Geophysical Research, Bulletin of the Seismological Society of America, Geophysics and other publications. Service on the faculty of the SAGE Geophysical Field Course, Institute of Geophysics and Planetary Physics, Los Alamos National Laboratory, since 1983. 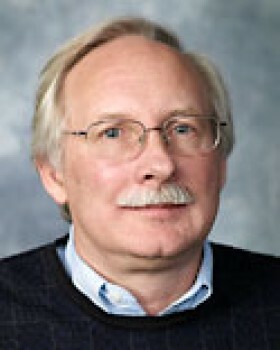 Associate Editor for the Special Section on 4D Gravity Monitoring, Geophysics, v. 73, n. 6, 2008. Service on a number of ad hoc third-year and tenure review committees in the Schools of Natural Sciences and Mathematics and the Eric Jonnson School of Engineering and Computer Science. Service on a number of academic search commitees for Departments of Geosciences, Physics and the Geographical Information Sciences Program. Doctor of Philosophy: 1) Harry, Dennis L., Ph.D., 1989, Lithospheric Flexure: Applications of Geophysical Inverse Theory and Empirical Studies of Rock Deformation. 2) Karabulut, Hayrullah, Ph.D., 1996, Application of Boundary Element Method and Simulated Annealing to Seismic Data. 3) Hare, Jennifer, Ph.D., 1998, High Resolution Techniques for Monitoring Fluid Levels Over Time. 4) Zhou, Yu, Ph.D., 2002, Wavelet Transforms in Seismic Data Processing and Imaging. 5) Chen, Tianyou, Ph. D., 2004, Applications of High Accuracy Gravity and Space Geodesy Methodologies. Master of Science: 1) Grotte, James R., M.S., 1985, The Development and Application of the Werner Deconvolution and 2-D Filtering to Gravity and Magnetic Data in S.E. Virginia. 2) Reamer, Sharon K., M.S., 1986, Improvements to the Fourier Gravity Inversion Method with Applications. 3) Hersey, David R., M.S., 1986, Geophysical Investigation of the Eastern Margin of the Espanola Basin, New Mexico. 4) Heidesch, Russell J., M.S., 1987, A Wide Angle Seismic Investigation of Pahute Mesa, Nevada. 5) Madtson, Eric A., M.S., 1990, Seismic Polarization Analysis. 6) Axilrod, Herbert D., M.S., 1996, SH Wave Scattering from a Sinusoidal Grating. 7) Searcy, Amy M., M.S. (Mathematics), 1998, Geological Surface Evolution Modeling: Numerical Simulations Using Diffusion-Type Equations. 8) Smith, David, M. S., 2000, Constrained Inversion of Seismic Refraction Data and Re-Mapping of Quaternary Deposits in Dallas County, Texas. 9) Thavoris, Ioannis, M. S., 2001, Geophysical Survey of MDA-B Waste Disposal Site at DP Mesa Los Alamos, NM. 10) Henderson, Tracey, M. S., 2002, Integrated Seismic and Gravity Study in Offshore Oman. 11) Hinz, Emily, M.S., 2007, Geophysical Applications to Archaeological Investigations.